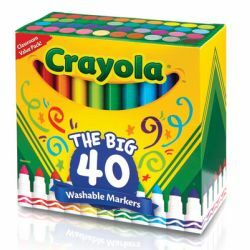 Crayola Ultra-Clean Washable Markers let kids color in a big way. 40 different vibrant, true colors. Markers are washable from skin, clothing and now painted walls! Great for classrooms. Broad line markers are perfect for coloring large area. AP Certified nontoxic.